Sigma Gamma Rho Sorority, Inc. was organized on November 12, 1922 in Indianapolis, Indiana by seven young educators: Mary Lou Allison Little, Dorothy Hanley Whiteside, Vivian White Marbury, Nannie Mae Gahn Johnson, Hattie Mae Dulin Redford, Bessie M. Downey Martin and Cubena McClure. The group became an incorporated national collegiate sorority on December 30, 1929, when a charter was granted to Alpha chapter at Butler University. Arizona State University is home to the Beta Pi chapter founded on December 10, 1952. Sigma Gamma Rho was the first sorority of the "Divine 9" to be established at ASU, as well as, in the state of Arizona. They continue to progress and excel through their national programs and events held on campus while bringing "Greater Service, Greater Progress" to the community. 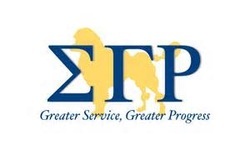 Sigma Gamma Rho Sorority's aim is to enhance the quality of life within the community. Public service, leadership development and education of youth are the hallmark of the organization's programs and activities. Sigma Gamma Rho Sorority addresses concerns that impact society educationally, civically, and economically.